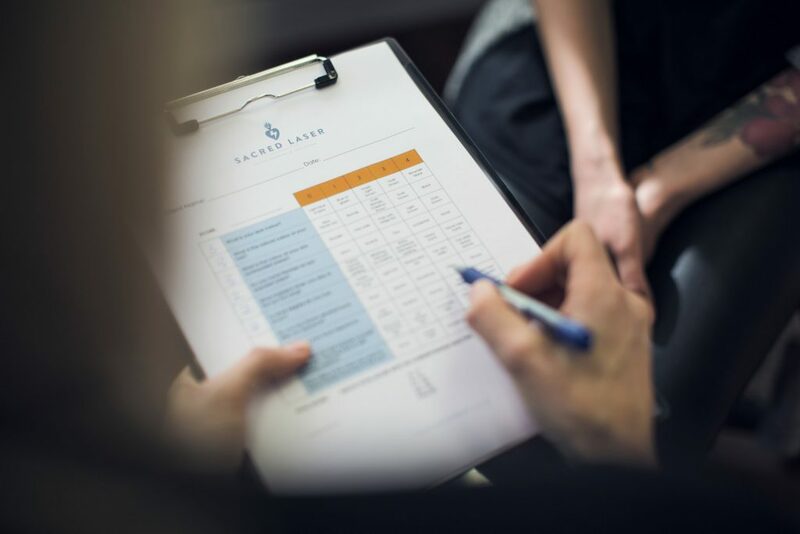 We thought we would write a brief article showing some of the early results of the work, we are doing with laser tattoo removal, going on here at Sacred Laser in Auckland. 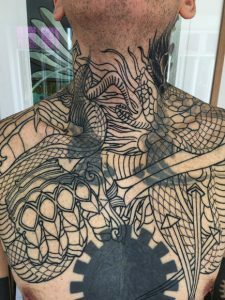 Sometimes full tattoo removal is definitely the best option but more so we find that people who have tattoos generally don’t want to not have tattoos at all, they just want the opportunity to wear the tattoos that the really want. 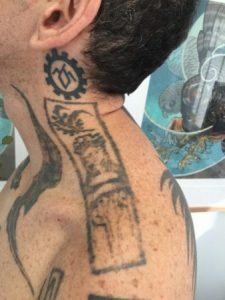 As we mature our tastes may change or more often the tattoo we received just didn’t turn out the way we wanted it to go. Something that you wanted to wear with pride for the rest of your days you end up hiding, or maybe as we become more tattooed we start looking at our over all concept differently, with a more educated eye and that small arm piece is now right in the middle of a larger concept. As you can see in the first photo the black blade like shapes are part of a graphic bat design on his chest coming up onto his neck, this is actually a partial cover up already with multiple layers of ink and the panel design on top of the shoulders needs to go as well. 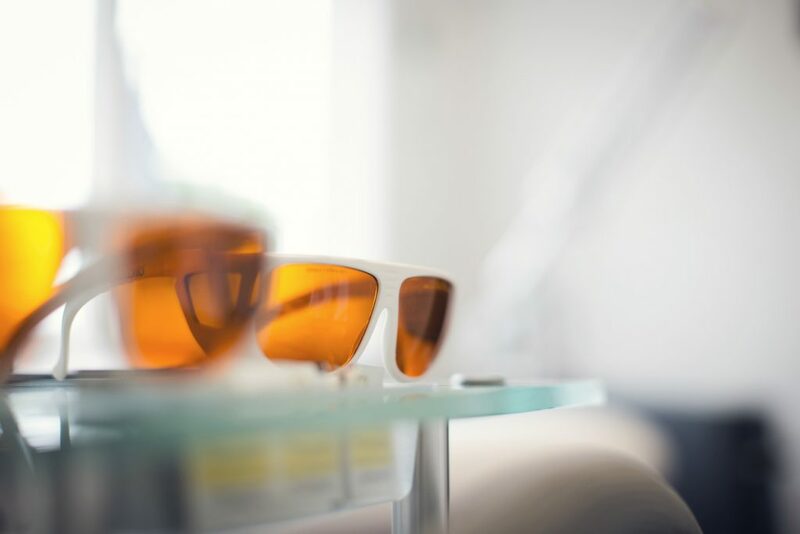 These next photos you can see the excellent results from the Cynosure Medlite Laser breaking up the black and dispersing the ink over TWO sessions. 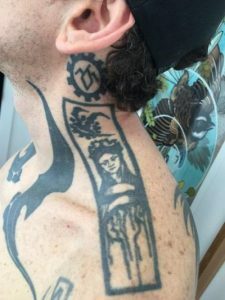 These photos are the start of the cover up process, one side of the neck is finished and this other side is just in the outline process so you can see how dark the new black is next to the old. There was a THIRD session of laser before this but we missed the photo opportunity when mark jumped into a space that Dean had in his schedule. 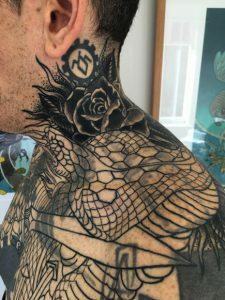 As you can tell there would be no possible way to get this new work with the old black tattoo in the way but in only 3 sessions we have lightened things enough for Dean Sacred to do a complete cover up without being hindered by the heavy tattoo there before. We will post more on this cover up and others in the future and we couldn’t be more excited to show you what can be achieved with a relatively small amount of laser sessions. If you didn’t believe in tattoo second chances we hope we have shown you something new — and got you thinking again.